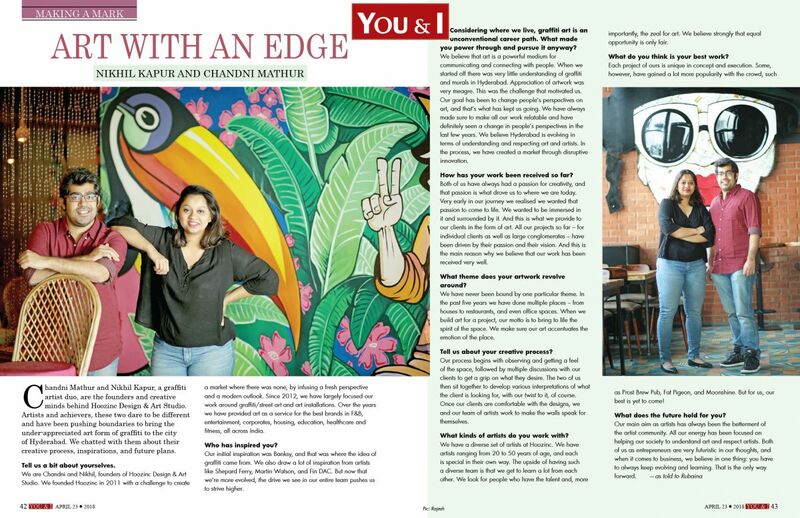 Chandni Mathur and Nikhil Kapur, a graffiti artist duo, are the founders and creative minds behind Hoozinc Design & Art Studio. 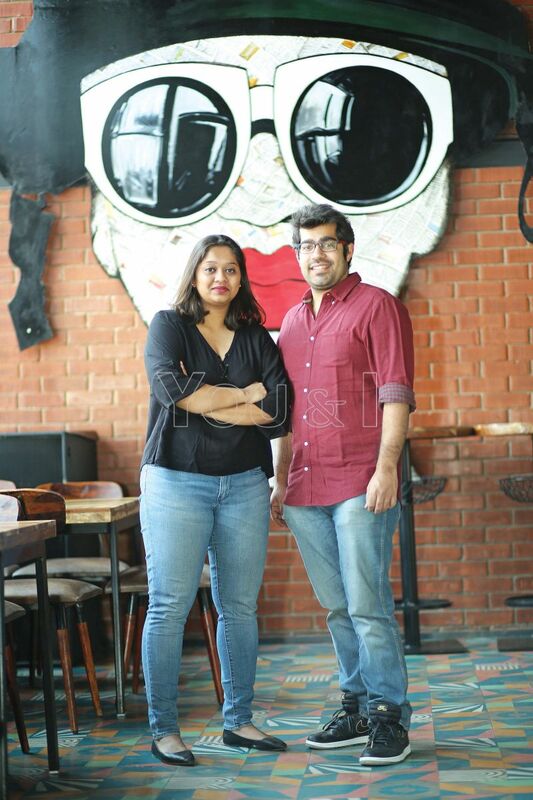 Artists and achievers, these two dare to be different and have been pushing boundaries to bring the under-appreciated art form of graffiti to the city of Hyderabad. We chatted with them about their creative process, inspirations, and future plans. We are Chandni and Nikhil, founders of Hoozinc Design & Art Studio. We founded Hoozinc in 2011 with a challenge to create a market where there was none, by infusing a fresh perspective and a modern outlook. Since 2012, we have largely focused our work around graffiti/street art and art installations. Over the years we have provided art as a service for the best brands in F&B, entertainment, corporates, housing, education, healthcare and fitness, all across India. Our initial inspiration was Banksy, and that was where the idea of graffiti came from. We also draw a lot of inspiration from artists like Shepard Ferry, Martin Watson, and Fin DAC. But now that we’re more evolved, the drive we see in our entire team pushes us to strive higher. Considering where we live, graffiti art is an unconventional career path. What made you power through and pursue it anyway? We believe that art is a powerful medium for communicating and connecting with people. When we started off there was very little understanding of graffiti and murals in Hyderabad. Appreciation of artwork was very meagre. This was the challenge that motivated us. Our goal has been to change people’s perspectives on art, and that’s what has kept us going. We have always made sure to make all our work relatable and have definitely seen a change in people’s perspectives in the last few years. We believe Hyderabad is evolving in terms of understanding and respecting art and artists. In the process, we have created a market through disruptive innovation. How has your work been received so far? Both of us have always had a passion for creativity, and that passion is what drove us to where we are today. Very early in our journey we realised we wanted that passion to come to life. We wanted to be immersed in it and surrounded by it. And this is what we provide to our clients in the form of art. All our projects so far – for individual clients as well as large conglomerates – have been driven by their passion and their vision. And this is the main reason why we believe that our work has been received very well. What theme does your artwork revolve around? We have never been bound by one particular theme. In the past five years we have done multiple places – from houses to restaurants, and even office spaces. When we build art for a project, our motto is to bring to life the spirit of the space. We make sure our art accentuates the emotion of the place. Our process begins with observing and getting a feel of the space, followed by multiple discussions with our clients to get a grip on what they desire. The two of us then sit together to develop various interpretations of what the client is looking for, with our twist to it, of course. Once our clients are comfortable with the designs, we and our team of artists work to make the walls speak for themselves. What kinds of artists do you work with? We have a diverse set of artists at Hoozinc. We have artists ranging from 20 to 50 years of age, and each is special in their own way. The upside of having such a diverse team is that we get to learn a lot from each other. We look for people who have the talent and, more importantly, the zeal for art. We believe strongly that equal opportunity is only fair. What do you think is your best work? Each project of ours is unique in concept and execution. Some, however, have gained a lot more popularity with the crowd, such as Prost Brew Pub, Fat Pigeon, and Moonshine. But for us, our best is yet to come!